Rhubarb is often used in the kitchen as if it was a fruit but it is most definitely a vegetable. Of all the vegetables it has three outstanding qualities - it loves the cold British winters and only a very late frost can damage the crop. Its second top quality is that it produces a crop of delicious stalks as early as the beginning of March and will continue to provide stalks until late June. Finally, rhubarb is almost indestructible although some tender loving care and attention will definitely produce a much better harvest. Rhubarb plants can be bought from garden centres for planting or can be cut from existing plants (see rhubarb propagation below). Either way, the planting process is the same (read below). The best time to plant rhubarb is in mid to late autumn time, October to December is about right but up to mid March will also be OK.
Rhubarb is very tolerant of most soil conditions but it does not like being waterlogged which only encourages crown rot. Too much water is bad for rhubarb but is does appreciate a constant supply of moisture. They also do well if fed with well-rotted manure or organic long-lasting fertilisers such as blood, fish and bone. As far as sun goes they prefer semi-shade, with some shade especially to protect them from the hot summer midday and afternoon weather. When you receive your plant check that the soil surface in the pot is weed free because weeding later on can be a problem with rhubarb. Dig a hole which is twice as wide as the rhubarb roots and add lots of compost mixed in with soil until the hole is just slightly wider compared to the rhubarb root. 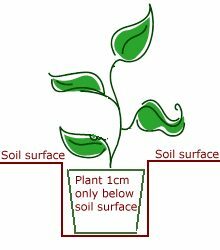 You need to place the plant in the hole so that the soil in the pot is just slightly deeper than the soil level. If is is planted too deep then there is a risk of crown rot, if not deep enough then the new plant may dry out. See our amateur diagram on the right for a clearer explanation. Fill in around your rhubarb plant with crumbly soil and multi-purpose compost. gently firm down as you fill in with soil and then firm down the final soil surface. Water well. The only difference between planting a pot grown rhubarb and one which has been cut from an existing plant is that the pot grown one may well have some growth above the surface whereas a cut plant will have no growth. Rhubarb can be propagated in three ways although only one method is really practical for the amateur gardener. The most impractical (nigh on impossible for the amateur) is to propagate from the flesh of the rhubarb. Professional growers do this to ensure the plant material is entirely free from disease but the equipment and experience involved is extensive. The second method is to grow rhubarb from seed, however this is a long process and rhubarb seed often does not grow true to type so you may well take several years to grow rhubarb from seed only to find that the plant produces a very poor crop. The remaining method of propagation is to divide a rhubarb and this is the method which almost all amateur gardener's use. If you use your own rhubarb crowns or those of a fellow gardener, it's free and at the same time it's almost foolproof. The best time to divide an existing rhubarb plant is when it is four or more years old. Division of the plant will improve its vigour not reduce it and you will in all probability end up with three or more separate plants. In order to avoid stress to the plant being divided and give the best best chance of success to the new one, late October to mid January is the best time for division to take place. Dig up the rhubarb and remove most of the loose earth from it. We suggest dividing a five year old crown into three pieces and the best way to do this is to take a clean spade and use it to chop the crown into three pieces. Try to make the cuts as clean as possible without hacking at it too much. This may sound a bit barbarian but it is the best way to divide rhubarb crowns. The centre of the crown is the least suitable portion, the outer parts are the best as long as each has a growing point in them. Planting is exactly the same as described in the previous section of this page. For information on caring for your rhubarb as it grows click one of the links below.